A blazer is an extremely appreciated piece of outfit, very much worn during the winter. And since, the cold season is a little more difficult, your entire wardrobe suffers drastic changes. 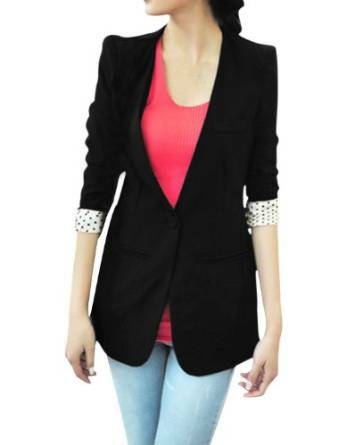 During the latest years the blazer is definitely ruling the women’s clothing style. This piece of outfit has become a first-rate for any wardrobe, being worn by women with different clothing styles, from all over the world. I identify three types of blazers: tuxedo, boyfriend style and classic. A tuxedo blazer is a little shorter than the hips line, but it doesn’t go up the waist too much. It has very narrow lapels and the back part is longer than the front one. You can easily wear it over evening dresses. This type of blazer is inspired by the male fashion. It is pretty large, non-arched but very fit on your shoulders. It goes very well with skinny jeans, tights or ripped jeans. As its name states, this is the classic type of blazer, very much known, usually arched, with 2 or 3 buttons. It will flatter a lot your silhouette and can be worn not only with an office outfit but with a casual one too. The blazer is an extremely versatile piece of outfit which can be worn with almost everything, from ripped jeans to evening dresses.